Ah, the racoon. Nature’s biggest pest. This may be a cute little creature, but they can sure do a number on your home in terms of the damage that they can cause. This is why keeping them away is something that is absolutely essential to keeping you and your family healthy, as well as your home safe from damage. The problem for some people is that they may not even know that there is a raccoon if there. These little critters can be quite sneaky in the way that they hide themselves, making it difficult for you to know if they are even there. However, there are signs that a raccoon is in your home, and one of the is if you notice that there is raccoon feces in your house or on your property. Learn more: Do raccoons use tools? This would be a great clue, but many have no idea what raccoon feces even looks like. That makes it a problem to be able to use this as a sign that one is around. However, you don’t need to be ignorant about this. If you want to know what raccoon feces looks like then here is a little explanation for you. Oddly enough, while a raccoon is a little smaller than a dog, their feces is about that same size as a canine. While the have a similar size as a dog, the composition is nothing like it at all. No matter what a raccoon will eat, one of the things that you will notice about its feces is the fact that it looks like there is seeds and it. Once again, even if they have not eaten these it will still show in this way. In terms of color, it is quite dark, nearly black, and you will find that it doesn’t stay particularly consistent. It’s not like human or dog feces which can be lumped together, but actually comes out kind of tattered. This makes it look like it is kind of stringy and not actually connected as one piece or one continuous pile. Finding raccoon feces is not difficult if they are on your property or in your home. 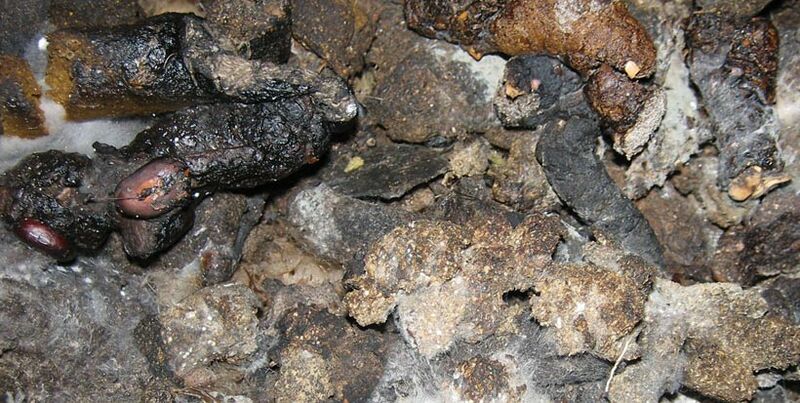 While most animals of this kind will poop just about anywhere, a raccoon is quite different. There are likely to choose one single location in which to go to the bathroom, referred to as the latrine. If they have taken over your attic area, this is one of the telltale signs that you have a raccoon in your home, because you will find a single spot where the animal is relieving him or herself. The one thing to be aware of is that if you come across a raccoon’s feces you should be very careful around it. These animals release a large amount of bacteria parasites in their feces, which can be quite harmful to you. It is your best interest to stay as far away from this as possible so that you do not contract something and become sick. Read more: Raccoon Control, how to get rid of raccoons, Raccoon Feces, How to get raccoons out of the ceiling.